Virginia Auto Service, provides complete timing belt replacement and repair in Phoenix, Arizona. Call us for a free 2nd opinion before you buy. 602-266-0200. Schedule an appointment online. 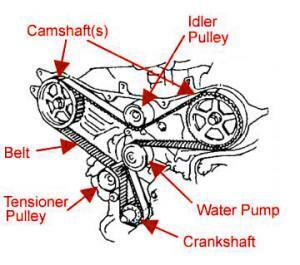 The timing belt is a rubber band or belt that connects crankshaft to the camshaft on the front of the engine. This makes sure that pistons and valves in your engine are raised and lowered at the proper time, keeping the operation of the engine smooth and efficient. Without the timing belt, your engine has no guideline for when to raise and lower the machinery in your engine; and if these pieces collide, serious damage can occur. In the extreme driving conditions in Phoenix, Arizona, timing belt replacement is a common problem as the heat degrades timing belts very quickly. Here’s something you need to know: It’s much cheaper to replace a timing belt before it breaks down than after! What are the symptoms of a bad timing belt? or When does your timing belt need replaced? A bad timing belt can experience any or all of the following symptoms: Note: Please make sure your vehicle is off and cooled off before you inspect the timing belt. Timing belt is loose. There should not be any “give” when you touch the timing belt. Timing belt is too tight. Timing belt is dry, cracked, or has nicks in it. The teeth in the timing belt are broken or missing. The timing belt shows signs of dry rot. Over time, heat and motor oil will destroy a rubber timing belt. Car shakes when driving. Timing belts also help manage the “timing” of the car’s engine. If the car’s engine timing is off, such as not running smoothly, or shaking, it could be time to replace the timing belt. Broken timing belt. You don’t ever want to let your timing belt degenerate until it breaks as a timing belt usually breaks when the car is in motion and not only is it a terrible hassle, but it can destroy the engine of your car! Rough idle. A rough idle is one of the classic signs of a timing belt on its way out. There is a possibility that the belt has either stretched out to some degree or may be missing some teeth. If this is the case then it is very important to make the repair quickly, otherwise you risk further damage. Difficulty starting. Difficulty starting the vehicle is actually one of the preferable problems to have with the timing belt. If the vehicle were to start up and you begin driving on the freeway, there is an increased likelihood of valves impacting with pistons, destroying expensive components in the process. Excessive vibration. This is a situation that can stem from the timing belt wearing down past the point of usefulness, but not actually breaking. This kind of trouble is a sign that your timing belt is in danger of snapping at any moment and should be replaced immediately. Knocking noise. The fact is, if you start hearing knocking noises from the engine, you need to get it dealt with immediately. If the problem does turn out to be related to the timing belt then there is a strong possibility that the cost of repairs will be substantial. Timing belt hasn’t been replaced in over 90,000 miles. The best way to avoid all of these situations is to preemptively have the timing belt replaced according to your manufacturer’s recommended maintenance schedule.